Green Peas are low in fat but high in every other nutrients. A cup of peas has lots of protein, fiber and micronutrients. 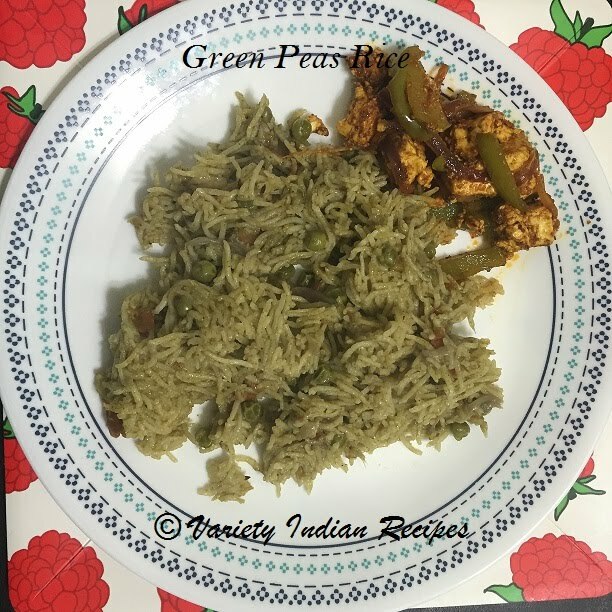 Try this simple but delicious rice recipe with green peas. Grind the above ingredients to a fine paste. Add onions and fry till the onions become translucent. Add the above grounded paste then add turmeric powder and saute over low heat, with frequent stirring. Add tomato and saute until tomato is half cooked. Now add green peas and saute for a minute. Add the soaked rice and mix well (Do not drain the water, use the water in which the rice was soaked. Do not add more water). Add salt to taste then add coriander leaves and allow to cook in pressure cooker or rice cooker. Remove pan from heat, add 1 tbsp of ghee, mix well and serve hot.